La Morena II is a 29' Twin Vee Catamaran with twin 200 four stroke outboard motors, along with a cabin including a walk in bathroom and queen size bed. Catamarans move through the water with much less drag than do monohulls, therefore it cuts through choppy water with much more stability- and comfort. It is especially great for long distance trips. Enrique is both the captain and owner of the boat, and fluent in both English and Spanish. He is especially good with children and elderly. Fishing: We have top of the line equipment: avet, shimano, and penn reels, along with outriggers and tuna tubes. Local Offshore: Outside of Punta de Mita and Sayulita are excellent grounds for Dorado, Sailfish, Toro, Roosterfish, and Pargo (Snapper). Trips are 5-6 hours. 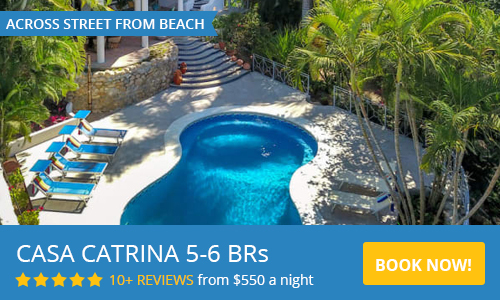 La Corbetena (The Rock): Located about 20 miles outside of Punta de Mita and about an hour boat ride from the Marina is “La Corbetena”. This massive rock mound with shallow reefs and steep drop off create a fisherman’s dream. La Roca Corbetena attracts Blue and Black Marlin, Yellow Fin Tuna, Pacific Sailfish, Dorado, Jack Cravelle, Mackerel, Pargo and Wahoo. El Banco (The Banks): Even further out, the famous underwater sea mount called “El Banco” wins the gold for fishing. This famous fishing site is where the possibilities of hooking onto a 600-lb Marlin or 300-lb Tuna are at. It is a much longer trip and more hours, but well worth it. Snorkeling: Come join us to this remote location that will be your own personal beach and amazing snorkelling. . There is also the Los Arcos Islands, located south of Puerto Vallarta, which is very popular for diving and snorkeling. This protected marine preserve offers several small islands offering reefs, tunnels, caves, and arches with a wide variety of sea life. The Mariettas Islands are now protected and only used for large boats for only 15 minutes at at time, so is not so magical anymore. Enrique makes this a personal experience for up to 6-8 people, and you will have the time of your life. Whale Watching: November through March, the Humpback Whales make their debut and return to the Bay of Banderas to mate and give birth to their calves. And occasionally you will see Orca's. They come down early November and leave around the end of March, which you will see the spectacular display of the humpbacks breaching the surface and put on an amazing show for the whole family. All right here, inside and outside of the Banderas Bay- and Sayulita. Never heard back from them?? I wish I could review them. Unfortunately, they never responded to our inquiry. Sorry, my computer and phone have been in the shop, and just got them back. Also boat is gettting painted, so out of the water. Excellent Time on the Water with Enrique and Armando! 6 of us went out last Friday with Enrique and Armando. Enrique said the fishing had been slow, so we where just planning on doing some bottom fishing, maybe go and anchor near a beach and do some snorkeling. After about an hour or two they noticed a bunch of birds diving so we over to check it out and noticed a massive bait boil. We hooked up almost immediately and spent the rest of the day chasing diving birds around the bay, catching fish and watching humpback whales breach! We had so much fun that we convinced Enrique and Armando to take us out again on Sunday (their day off) and had just as much fun the second day! Enrique and Armondo are such great people to go fishing with or sightseeing, whale watching, any activity on or off the water! Excellent English,great facts, tips and information regarding all the sea life. Fishing was not just fishing, with Armondo it was a chance to teach his clients about tying knots, baiting hooks and even live bait. We did a fishing trip with Enrique and his partner Armando. Both guys were extremely knowledgeable, helpful, and friendly and they showed us a really good time. We took our trip the day after a full moon in January, so we were prepared for disappointing fishing. But we went home with 2 big Mahi Mahi (one of which was 45lbs!) that Enrique filleted for us on the boat. They even treated us to some tuna sashimi from a fish they caught the day before! While we didn't hire them to take us whale watching, it was whale season and Enrique got us some excellent (close) views of humpback whales in the bay before we got into the open ocean. We all had a great time and I would hire Enrique and Armando again in a heartbeat! Enrique and first mate Armando are the best. We would highly recommend using Enrique for a fantastic time on the water. He will devise a plan for your crew and what you are looking to do. I have a 7 year old son that is a little crazy for fishing. I have a 5 year old daughter that is a little less crazy about fishing, but loves sea life and snorkeling. We explained our situation and goals to Enrique and he made it all happen! My son got to catch a huge Skip Jack and my daughter got to snorkel with the fishes. Capitan Enrique is your man for your next on-the-water adventure. This is a do not miss experience! Came for my 30th birthday with 9 people and had an absolute blast. Enrique and Armando were amazing hosts and super cool. Caught a couple big Mahi Mahi and ate an epic fish taco meal right after at a local restaurant near the marine. Next time we're fishing for Ahi and Marlins! Our family had a wonderful time on our fishing trip with La Morena. Enrique and his assitant Aramando were great with my 12-year-old son who is crazy for fishing, as well as my 16-year-old daughter who had never caught a fish before. The boat is good-sized and comfortable, and they took us to a great spot for some snorkeling. I would not hesitate to recommend them. We did a full day trip to La Corbetena. Everything was perfect. Enrique is an incredible captain and had us in the action all day. Even though the tuna and dorado had not been biting recently, we were able to land three yellowfins, one dorado, and a yellowtail. It was an extremely successful day and we couldn't have been more satisfied with the overall experience. We will be calling Enrique the next time we are in Sayulita. Oh, and Enrique's wife Kerry is extremely helpful and a great resource for information about the area. Enrique and Kerry even went out of their way to procure us a cooler to bring our fish back to the States. They are amazing! Take your kids, wife, husband whatever. Perfect English and Spanish. Great sense of humor. Great equipment. Funny and fun guy to be with. No rip off the tourist funny business. Enrique is my buddy. Have fished with him probably ten times including with my wife, kids, father, sister-in-law, nephews, friends etc. If the fish are biting, you will catch and also have a fun day.